There’s nothing better than Navy versus Army. ANNAPOLIS, Md. — There’s nothing better than Navy versus Army. The next men’s basketball chapter is written Saturday afternoon at West Point. “It’s a lot of emotion for both teams because as they come here to the Academy as freshman it’s always ‘Beat Army’. For those guys it’s always ‘Beat Navy’. So, from plebe summer on it’s what they hear every single day,” said Navy Head Coach Ed DeChellis. And for ten out of the 15 players on Navy’s roster, they’ll be experiencing the rivalry for the first time. Navy enters the matchup 6-10 overall. Army is 8-10. Both teams are 3-2 in the Patriot League, a game out of first place. The Midshipmen and Black Knights have actually split the regular season series in each of the last three seasons with the road team winning all six matchups. “I don’t know how to explain it. I don’t know what’s going on,” said Wieck. “I think it’s a lot of pressure on the home team and it’s a lot of noise on campus,” added DeChellis. 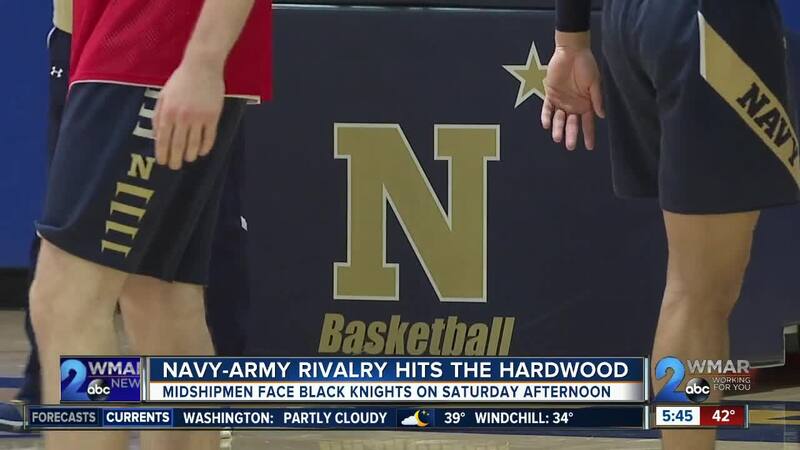 Navy is looking to win their seventh consecutive game at Army. The ball tips Saturday at 2:30 p.m.
Navy plays Army on the women’s side at noon on the same floor.